After showing Wallerawang at the 50th Anniversary AMRA exhibition at Liverpool, our group took our customary break before reconvening to work on the signals. In order to solder some of the trickier parts of the posts together, a resistance soldering iron was made from items mostly found in the scrap box. The iron allowed us to make tapered posts from 4 lengths of 1.2mm brass angle, held together by 1.4mm strapping. The brass was laid on top of a scale drawing of a post, and held in position with pins while it was soldered together. View of the resistance soldering iron showing the front panel, carbon tip, footswitch and ground lead. 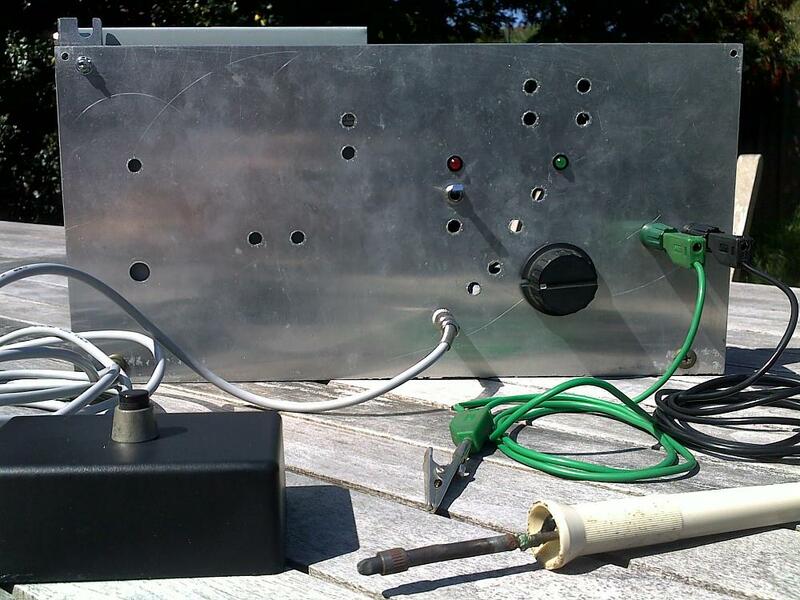 The resistance soldering iron was made from an old computer power supply. 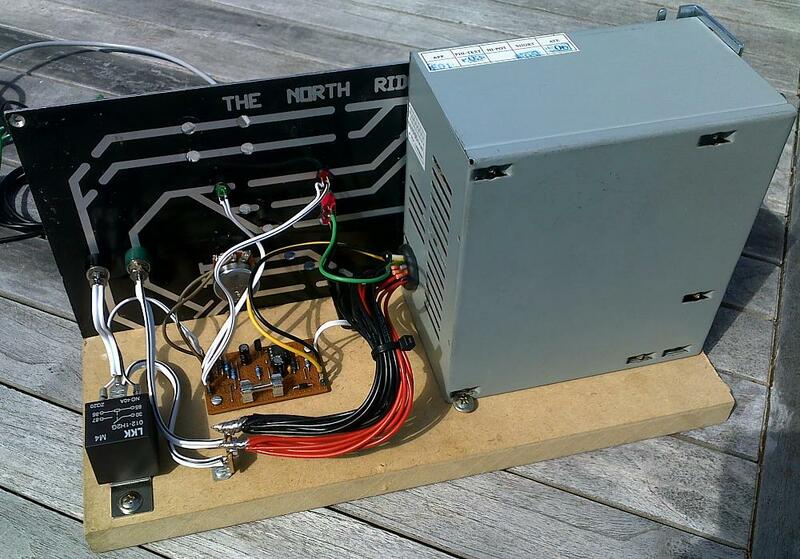 The 5V supply rails go through an automotive (12V) relay, controlled by a timer, to the tip. The iron itself an old pencil soldering iron which had a brass rod inserted at the tip, tapped to suit a Scope carbon element. The brass rod also had a 2mm hole drilled, so that the Scope element can be unscrewed and a 2mm pencil lead inserted, for finer soldering work. A footswitch triggers the timer, which controls the time the relay stays on, and therefore the power at the tip. The time duration is set by the knob on the front panel, and the green LED indicates when power is applied to the tip. A 3.5mm headphone plug and socket connects the footswitch to the timer circuit, which is powered by a 12V rail from the computer power supply. Rear view of the resistance soldering iron, showing the computer power supply, timer circuit, and automotive relay. The black wires go straight to the green ground post on the front panel (an old control panel for a layout), the red 5V wires go to the relay and then onto the carbon tip. The main components of the signals are the Gwydir Valley Models NSWR lower quadrant kits. Before the introduction of coloured light signals, Wallerawang predominately had lower quadrant semaphores, with one upper quadrant signal at the Sydney end of the Up platform. The parts for the upper quadrant signal were sourced from a Strath Hobbies kit. Three signals had already been built and added to the layout, so over the course of many meetings six of the seven remaining signals were put together. The single-post lower quadrant signals were constructed as per the kit instructions, with a slight modification to allow wires for 1.8mm warm white LEDs to run down inside the post (the LEDs are also from Gwydir Valley Models and come pre-wired). The LEDs, which will illuminate the spectacle plates, were hidden inside each lamp. The double post and upper quadrant signals were built from a combination of kit parts and brass pieces, using available pictures of the real signals and scale drawings as a guideline. Except for a couple of dummy arms, all semaphores and counterweights have been built to operate. 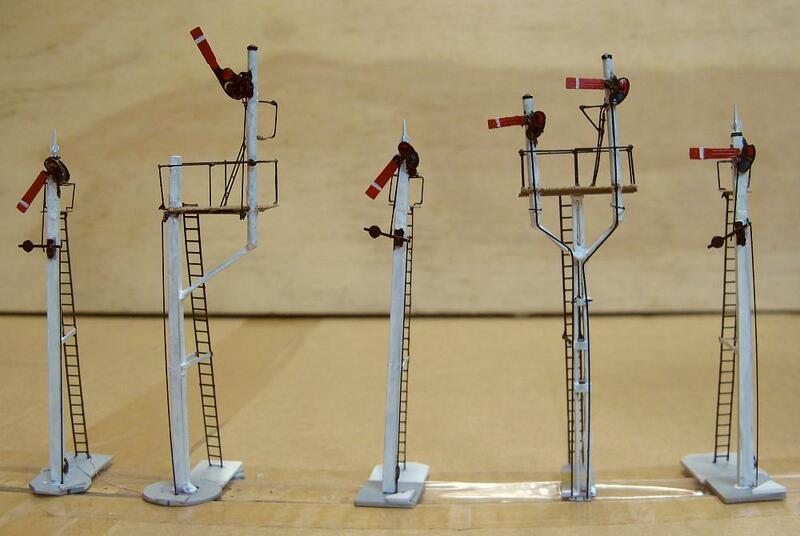 Five of the completed signals ready to be added to the layout. Every signal arm has been made so that it can move, and warm white LEDs added to light the spectacle plates. Closer view of the upper quadrant signal. The black brass wire is for moving the semaphore arm. The styrene base will be hidden under the scenery.